Yes, tortoises sometimes try to chase things, and yes, it's every bit as hilarious as you'd imagine. 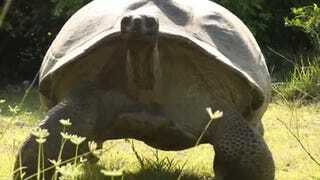 Several days ago, a National Geographic expedition to the remote island nation of Seychelles encountered something extraordinary: two giant tortoises mating. The male tortoise, none too happy about being caught in the act, proceeded to chase expedition leader Paul Rose and his cameraman with all the swiftness a tortoise can muster—which isn't saying much, at all.